Although a front mounted cooler is best for a race car, most of us don't want to give up trunk space or do all the cutting needed for such an installation. Bruce Schug has a nice setup of a Mazda oil cooler in his Corvair that will keep the oil cool in any street application. The oil cooler was found in the bone yard mounted under the radiator of a rotary Mazda. Look for one of the old sedans, can't remember the name, an RX-3 or RX-2 I think. I paid $35.00 in '86 or '87. Clean it good! I took mine to a self-serv car wash. Other coolers would work, probably at a much higher price. As I remember, the cooler comes with metric fittings. I think I cut these off and had new ones silver soldered onto the cooler. The cooler has an internal thermostat. The oil cooler adaptor has another. I just left them both in. Don't ask questions about using two thermostats or having air get in the lines etc. It works! The cooler is as wide as a radiator. Because my car has A/C, I cut the vertical support and mounted the cooler inside the plenum. It's a tight fit to get it in there, but it works. I built a couple of simple brackets and fastened them to the cooler and the car. The cooler fills most of the width, but not all, I used cardboard to form patterns for aluminum pieces to go at either end of the cooler. I sealed all the holes with silicone. This way ALL the air being pulled into the engine compartment by the fan passes through the oil cooler. On my A/C car, this air then passes through the A/C condenser, then either into the carbs, or across the engine for cooling. Don't worry about the air getting too warm, it won't. 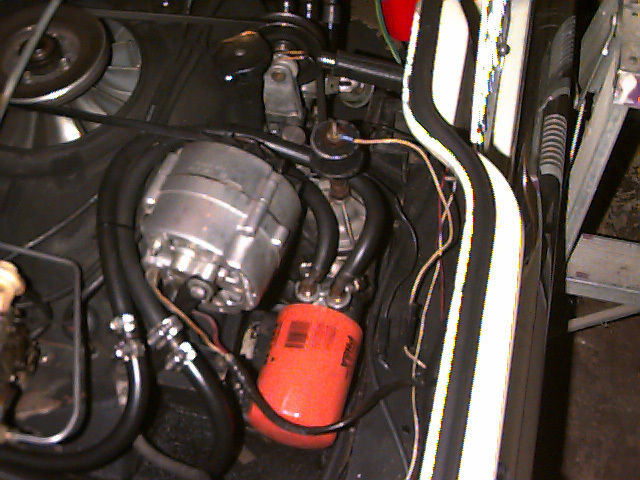 I cut holes in the floor of the plenum and ran the hoses through it, into the space, under the car, above the starter. 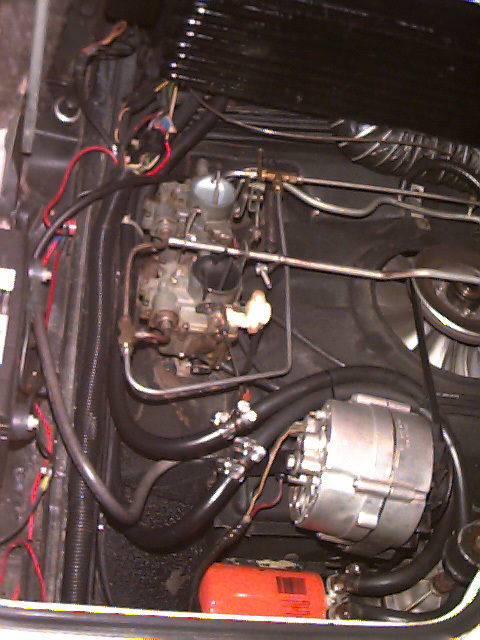 Then, the hoses go through the "firewall" and into the engine compartment. 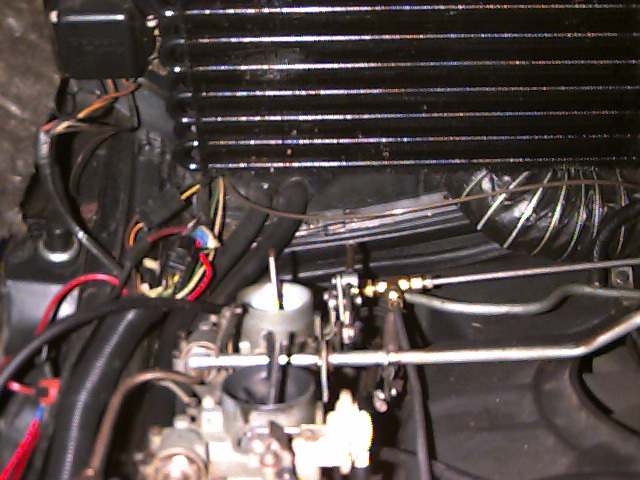 They run along on the left side, near the perimiter seal, to the left of the carbs, back behind the carbs. 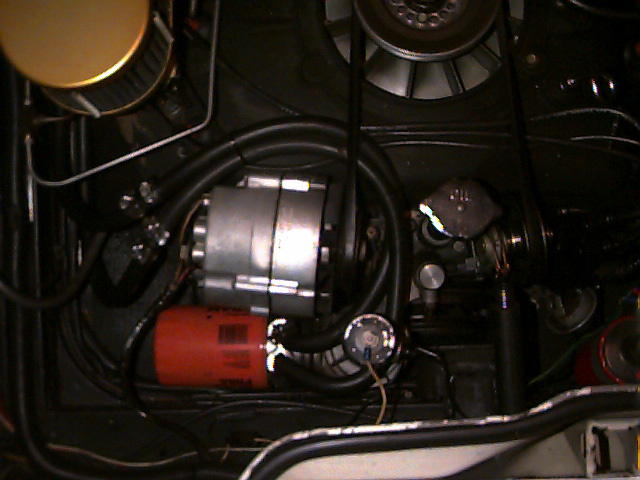 Then, they go toward the middle of the car, in front of the alternator and UNDER the fan belt. Next, they go between the alternator and the oil fill tube, and one on each side of the adapt a bolt that holds the A/C adaptor in the Delcotron adaptor.down to the adapter. I use the stock A/C right-angle adaptor first, the spin-on oil filter adaptor second, and the oil cooler adaptor third, in that order. The PH8A spins onto the oil cooler adaptor. The oil cooler adaptor is a Hayden unit. The identification on the box reads "205 ENGINE OIL COOLER SANDWICH ADAPTOR 3/4-16 THD". This is a regular adaptor identified for use on "CHRYSLER-FORD-IMPORTS". It simply fits the threads on the spin-on adaptor. It's a lot of hardware, but it works. Use 3/4" OUTSIDE diameter hoses to move the oil to and from the cooler. These must run toward the oil filler tube, then between it and the alternator, under the fan belt and around behind the alternator, then outside the carbs and back to holes you cut in the plenum panel and to the fittings on the cooler. They must be routed this way so you can easily change fanbelts. I secure the hoses with tie-wraps to keep them under the fan belt. They have gotten some "fan belt scars". Some have expressed concern about all the oil not draining back to the pan and all sorts of details. I don't argue with what works. When I change the oil, I drain it and refill it as usual. I suppose some old oil stays in the lines but I don't worry about it. I use a stock pump with a high pressure spring. Works fine. this was done under pretty controlled conditions, same day, same roads, etc. Here's another test that may interest you. This was done to see what difference the shrouds made. 82 degree ambient, Mazda cooler with and without lower shrouds. Last update: 26 August 2008. Copyright Bryan Blackwell.